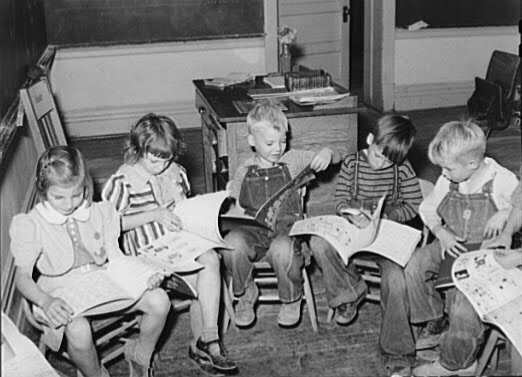 Children look at picture books at school in Santa Clara, Utah, in October 1940. Image courtesy of Wikimedia Commons. Associate professor of English at Pacific Lutheran University and author of Suspended Animation: Children's Picture Books and the Fairy Tale of Modernity. The New York Times recently published a piece on children’s reading that caused much grumbling and debate among my colleagues and students. In Julie Bosman’s “Picture Books No Longer a Staple for Children” (7 Oct 2010), which cites a downturn in picture-book purchases, adults report that children now grow out of (or are forced to abandon) picture books at an early age. “We’ve accelerated the graduation rate out of picture books,” says a children’s publisher, suggesting a public perception of onward-and-upward intellectual growth and of picture books as inconsequential. Although another publisher points out picture books’ interactivity, hinting at playful practices like reading aloud, sharing the reading experience, and toying with the visual-verbal text, hers is a minority viewpoint among those who want children to sit down, shut up, and read quietly. According to the article—which admittedly neglects factors like the current economy, picture book prices, the rise of comics, and the allure of e-readers like the NOOKcolor—picture book storytelling lacks practical applications. Rather than explore the complex meanings of interdependent words and pictures, becoming fluent in what some call multimodal literacy, children are encouraged to esteem text-heavy material and to think of illustrations as frivolous decorations. Competency with words alone, Bosman’s article implies, means children need not seek meaning in pictorial sequences or play with word-picture pairings. Further, since standardized tests do not test for critical literacy involving words and pictures, picture books are deemed pointless. In a particularly painful example, as far as I am concerned, a Texas mom requires her six-year-old “reluctant reader” to stick to chapter books and laments: “He would still read picture books now if we let him, because he doesn’t want to work to read.” He doesn’t want to work to read! Now, you may be thinking I balk at the idea of children working at their educations, or that I have an idealistic belief that we can restore children’s lost leisure time by prolonging the sweet, easy fun of picture books. Not quite. My attitude toward the picture book is not sentimental, although it does arise from deep concerns about past, present, and future generations’ critical literacy. In Suspended Animation: Children’s Picture Books and the Fairy Tale of Modernity, I discuss perceptions of picture books as simplistic, apolitical, and timeless. I reconsider picture books as either sophisticated or, at the very least, influential in multimedia culture. By looking at examples of American picture books of the 1920s through early 1940s—books with anachronistic perspectives—I examine how ideology and culture inhabit the 3D form and artistic/literary content of every children’s text. By rereading these surprising word-and-picture sequences of the past, readers see how adult authors and illustrators present attitudes and biases in ways calculated to inform and amuse young readers. For instance, by rereading popular picture books like The Story about Ping, The Story of Ferdinand, or Curious George, we now can see animals serving as substitutes for nonwhite or non-English-speaking people in stories taking place outside the United States. These books’ interdependent words and pictures give insight into 1930s ethnic and racial attitudes. Similarly, by looking at stories of friendly machines, like Mike Mulligan and His Steam Shovel or The Little Red Lighthouse and the Great Gray Bridge, we can see how writers and artists imagined alliances between human beings and automata in the thirties. These word-and-picture sequences present early-to-midcentury anxieties and suggest how adults proposed to resolve them, for good or ill, in tales for coming generations. Picture books deserve more scrutiny as cultural expressions and as worthwhile material for careful critical reading. Picture books are coded and (to put on my lit-crit cap) dialogic. Those who discount them miss out on opportunities for dialectical play, thoughtful inquiry, and occasional outrage. Suspended Animation sets out to revalue the sequential storytelling modeled in the picture book, to observe the material and analog format of the text, and to consider the complexities inherent in combining words and pictures. Find out more in Suspended Animation: Children's Picture Books and the Fairy Tale of Modernity. Great article! Your book touches on topics that I had would never have thought of, but are very important and interesting. I am very curious to see what you found in those early picture books. Thanks for sharing this information!